The Story in Paintings: What the Dickens? Charles Dickens (1812-70) was one of the most successful writers in history, and a true child of the nineteenth century. With increasing literacy and the progressive introduction of compulsory education throughout much of Europe, he and others such as Mark Twain, Edgar Allan Poe, Arthur Conan Doyle, Victor Hugo, Tolstoy, Flaubert, Balzac, and Dostoevsky, were hugely popular story-tellers of the day. Many of their popular works were published very successfully in illustrated editions, yet hardly any of their narratives are told in paintings. This article examines what happened to those popular stories of the nineteenth century. Unlike previous articles in this series, it tells its story by the remarkable lack of paintings. A succession of pure illustrators and established artists produced illustrations for Dickens’ books and the others which sold so well during the nineteenth century. 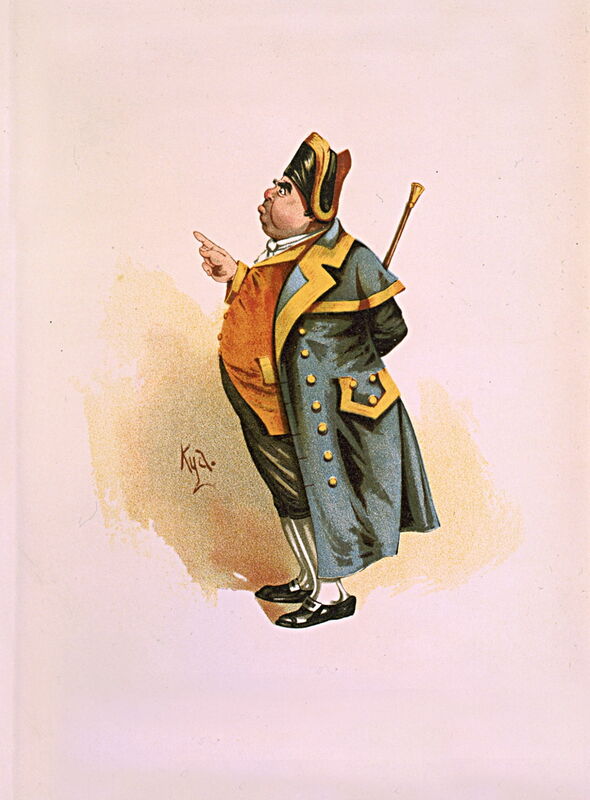 Among the most prolific illustrators of Dickens were Hablot Knight Browne – better known as Phiz – George Cruikshank, John Gilbert, and Augustus Leopold Egg. 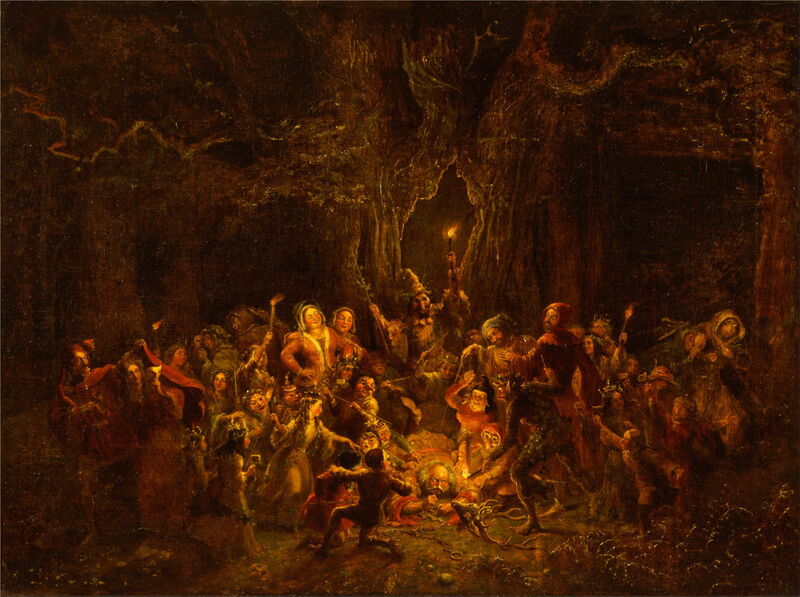 Although George Cruikshank‘s (1792–1878) paintings are less well-known, he did paint narrative works, such as that showing Herne’s Oak from Shakespeare’s 1602 comedy, The Merry Wives of Windsor. George Cruikshank (1792–1878), Herne’s Oak from ‘The Merry Wives of Windsor,’ V, v (c 1857), oil on canvas, 91.4 x 121.9 cm, Yale Center for British Art, New Haven, CT. Wikimedia Commons. I can find no painting by Cruikshank depicting any characters or scene from any of Dickens’ novels, despite his intimate familiarity with them. Three other artists who illustrated Dickens did, though, produce paintings of relevance. Joseph Clayton Clarke (better known as Kyd) (1857-1937) painted many portraits of Dickens’ characters, such as the splendid rendering of Mr Bumble from Oliver Twist, shown below. But he did not go so far as to produce any narrative paintings, as far as I can discover. Joseph Clayton Clarke (‘Kyd’) (1857-1937), From “Character Sketches from Charles Dickens, Pourtrayed by Kyd”, or “The Characters of Charles Dickens Portrayed in a Series of Original Water Colour Sketches by Kyd.” (c 1890), print, locations various. Wikimedia Commons. Charles Edmund Brock‘s (1870-1938) watercolour of Oliver Twist is also closer, but turns out to be one of many such paintings which he produced as illustrations for Dickens’ books. Charles Edmund Brock (1870-1938), Oliver Twist. 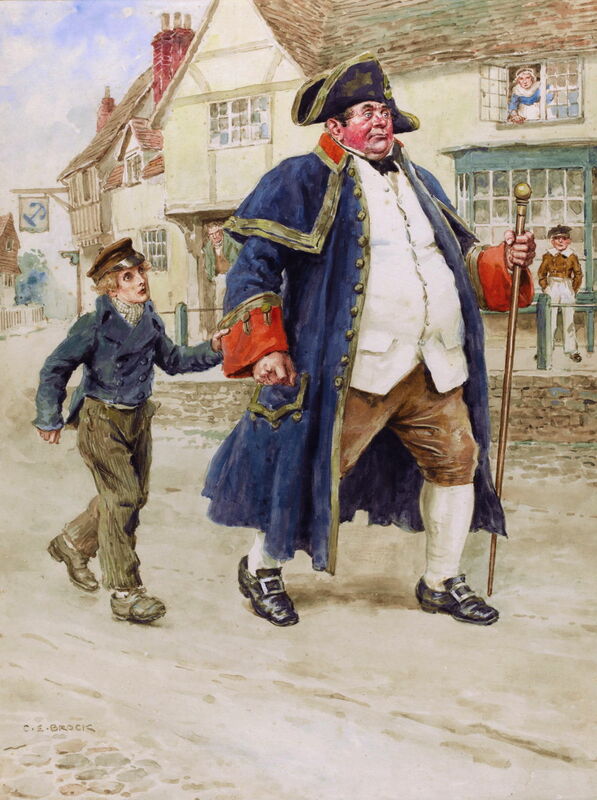 “Mr Bumble walked on with long strides… Little Oliver firmly grasping his gold laced cuff trotted beside him.” (c 1900), watercolour, 29 x 21.7 cm, Private collection. Wikimedia Commons. Where painters have been responsible for creating book illustrations, as in the case of Sir Luke Fildes (1843–1927), their illustrative work and paintings appear to overlap very little indeed. 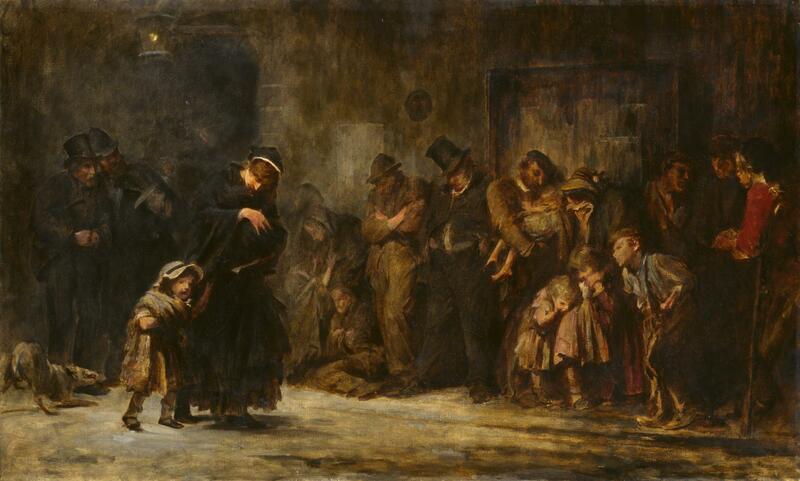 Although Fildes was commissioned to produce illustrations for Dickens’ last book, The Mystery of Edwin Drood, his own paintings on related subjects did not draw on Dickens’ stories. Dumb, wet, silent horrors! Sphinxes set up against that dead wall, and none likely to be at the pains of solving them until the general overthrow. 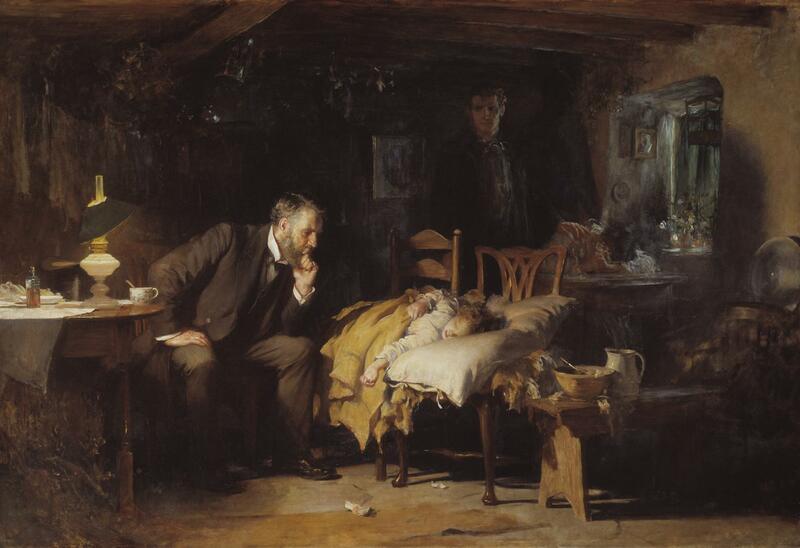 Fildes’ later The Doctor (1891) was commissioned by Sir Henry Tate, but the story tells of Fildes’ own personal tragedy when his infant son died in 1877. He even built a replica of a fisherman’s cottage in a corner of his studio to give the background greater authenticity of his own fictitious narrative which the painting shows. The only artist in the nineteenth century who seems to have painted any significant number of narrative works drawn from contemporary popular stories is Robert Braithwaite Martineau (1826-1869). 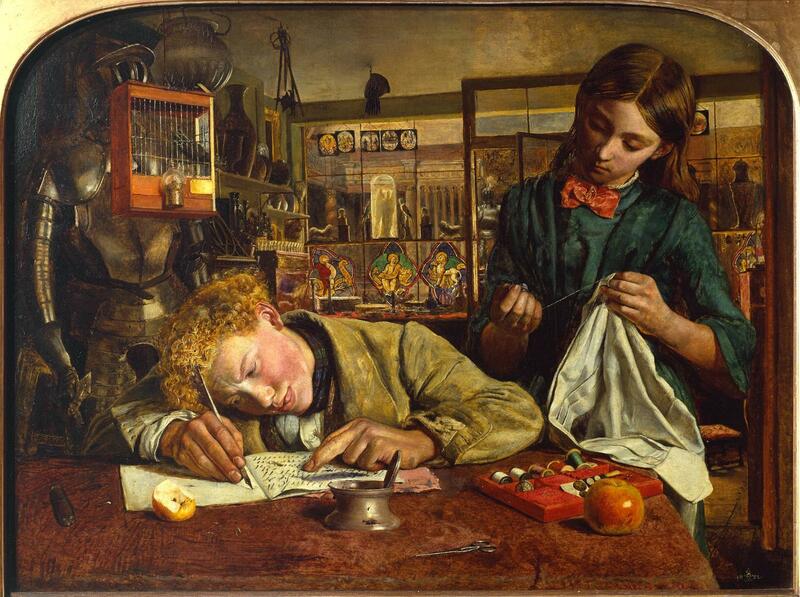 The Tate Gallery has two such paintings of his: Kit’s Writing Lesson (1852), above, showing a less than memorable scene from Dickens’ The Old Curiosity Shop, and Picciola (1853), based on the 1836 novel of the same name by the obscure French novellist Xavier Boniface Saintine (1798-1865). Narrative paintings were still very popular in the works of the Pre-Raphaelite Brotherhood, and their followers. But as I have detailed in other articles, their preference for narrative sources was very selective when it came to the contemporary. You will not find any Dickens among the core members of the Brotherhood, nor the likes of JW Waterhouse. He is also omitted from later problem pictures even in indirect reference. 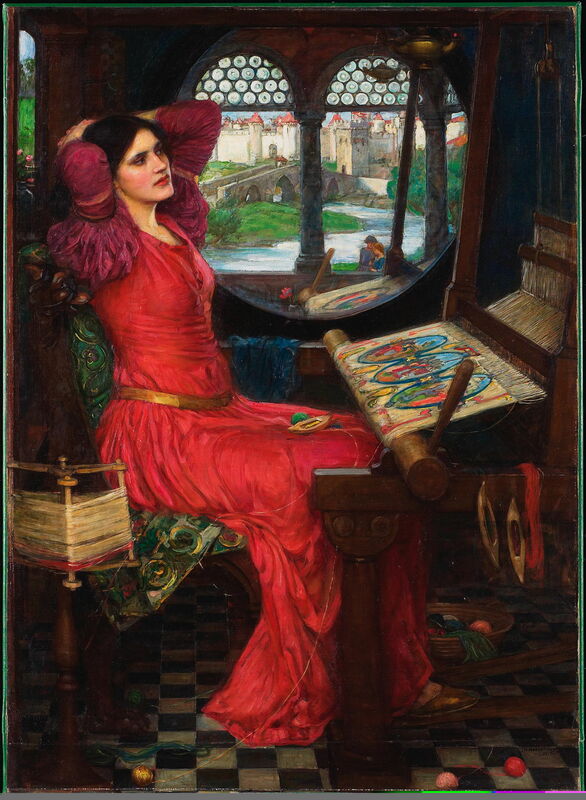 Where these prominent artists did refer to contemporary writing, they preferred the likes of Alfred Lord Tennyson’s (1809–1892) poem The Lady of Shalott, which recounts part of the Arthurian legends as retold in an Italian novella from the 1200s. John William Waterhouse (1849–1917), “I am Half Sick of Shadows” said the Lady of Shalott (1915), oil on canvas, 100 x 74 cm, Art Gallery of Ontario, Toronto, Canada. Wikimedia Commons. Even when they constructed narrative series of paintings, Dickens does not seem to have been appropriate as their basis. Prolific illustrators who also painted, such as Gustave Doré and Walter Crane, seldom chose to paint contemporary narrative. When the few Impressionists painted narrative works, even Cézanne who was from childhood a close friend of Émile Zola, did not depict any contemporary stories. Extensive references on narrative themes in paintings, such as Roberts (1998, 2014), confirm that hardly any significant paintings use themes from the great nineteenth century novels. The most obvious exception to this was in Finland, where the ‘new’ Kalevala was published in 1849, and quickly became the dominant theme in painting. The reason, I think, was the general belief that, great though they were, these popular novels and other prose works were not appropriate subjects for fine art. Classics and poetry, perhaps, but a painting based on a mass-market and often serialised novel could not be fine art. Yet the many religious paintings of the Renaissance which went into places of worship were surely just as populist. Perhaps even the Impressionists saw themselves as catering for a market dominated by rich patrons and purchasers, rather than those who avidly read Dickens or Zola. Roberts HE (1998, 2014) Encyclopedia of Comparative Iconography, Themes Depicted in Works of Art, 2 vols, Routledge. ISBN 978 1 138 89259 0, 978 1 138 89260 6. Posted in General, Language, Painting and tagged Brock, Cruikshank, Dickens, Fildes, Kyd, narrative, painting, Phiz. Bookmark the permalink. Apple’s vanishing release notes: arrogance or incompetence?